Following the 1662 Act of Uniformity requiring assent of all ministers to follow prescribed forms of public prayer, rites and ceremonies as the Church of England tried to re-establish its authority after years of Puritan activity – ministers also required Episcopal ordination. Over 2000 ministers objected to this and many became dissenters and left the Anglican Churches. In Henley, these dissenters initially worshipped in Harpsden Wood. 1672 – A Declaration of Indulgence allowed dissenting worship under licence and Thomas Cole was the first licensed in Henley as a Congregational teacher. 1674 – The first named leader for the Church was regular preacher was John Gyles who led the congregation until his death in 1683.There is a wonderful poem to John on the North wall of the present Church. 1679 – Thomas Hall allows the use of Bernard’s Barn for worship on Southfield, near the site of the present church (then still outside the boundary of Henley). 1719 – The first church building (chapel) was erected near Bernard’s barn. 1748 – 1776 One of the most memorable early leaders of the Church was Humphrey Gainsborough, brother of the famous painter, Thomas, but himself a renowned inventor, engineer, steam engine designer and one of the key advocates of the time in keeping Henley’s trade route to London via designs for new locks on the Thames. There is an Oxford blue plaque to his memory on the gates of the Church grounds. Worshippers at Henley were joined by many Huguenot refugees who fled from France after the edict of Nantes in 1685, among them the Beuzeville and Roussel families, who played a significant role in the church life in the 18th and early 19th centuries. 1809 – A Sunday School was started in 1809 under the ministry of James Churchill (1807-1813). Improvements to the chapel and manse were made by the pastor John Nelson Goulty (1815–24), a cousin of Admiral Nelson. 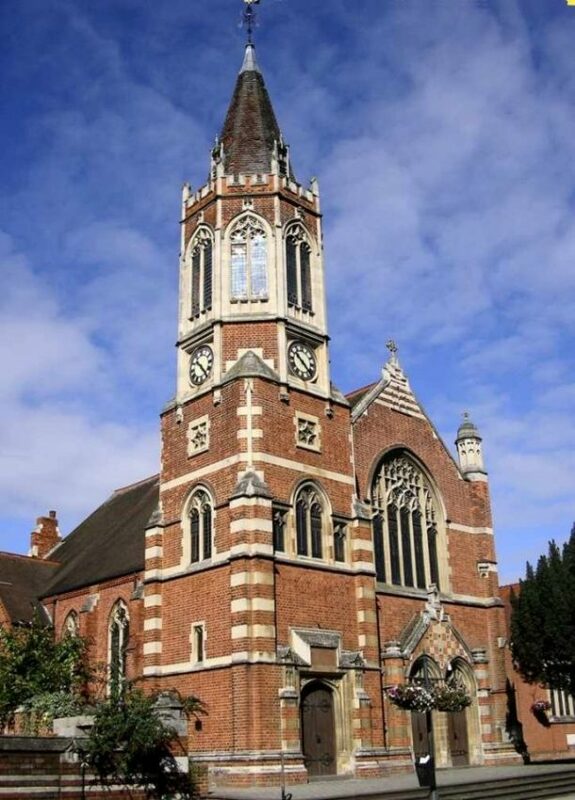 1824 – Robert Bolton brought his ministry to the Henley Chapel in 1824. The congregation increased and side galleries were added to the 1719 building in 1826. In February 1829, the foundation stone of an addition was laid, and later two rooms were added to the manse, which had been bought in 1784. Bolton, from Savannah, Georgia, USA studied for the ministry under the senior William Jay, who was known as “the Divine of Bath” when he began preaching at the age of seventeen. 1829 – The re-opening ceremony was attended by the evangelical preacher Rowland Hill and Congregationalist minister Robert Bolton who was the brother-in-law to William Jay, the famous architect. William Jay the architect designed & built the addition to the manse and enlarged the then existing church in 1829 when Robert Bolton was the minister. William Jay the architect was never ordained. He spent five years in America designing buildings in Savannah, Georgia and Charleston, South Carolina before returning to England. Unfortunately, he went bankrupt and ended up as Inspector of Works in Mauritius, where he died in 1837, aged around 45. 1856 – James Rowland (pastor 1836-72), son of a Pembrokeshire farmer, established a British school for children of Nonconformists who would otherwise have received no education, and made further improvements including installation of an organ. 1874 – His successor Joseph Jackson Goadby took up the ministry and quickly became involved in town life, establishing theLiberal Henley Free Press newspaper, founding a footpaths society, and working for local charities. A cultured man of broad interests, he nevertheless displayed a common touch in his ‘racy talks to working men and popular audiences’, which presumably enhanced the Congregationalists’ local appeal. 1892 – John Taylor, his successor, was similarly popular among the town’s poor, and was an enthusiastic supporter of thesocialistic Brotherhood Movement, co-founding the ‘Henley Pleasant Sunday Afternoon Brotherhood’ in 1893. By the early 1900’s the building was inadequate. Fund-raising for a new and larger church was initiated by Taylor’s successor Sydney Tucker, who had already successfully renovated the manse (1900), built an infants’ school room (1901), and erected a handsome new church hall (Pither Hall) with space for 300 people (1904). Because of the increased road traffic of the early 1900’s, it was decided to move the main church building further back to allow a wider road. In 1908, the present church building was opened. Designed by Hampden W. Pratt, it is an impressive brick structure with yellow stone dressings, gothic-style tracery, and flamboyant Art Nouveau glass — a clear statement of the Congregationalists’ importance in the town. Benefactors included Frank Crisp of Friar Park, who, though not himself a Congregationalist, paid for the flamboyant south-east tower in memory of a nonconformist grandfather; the rebuilding was, however, a truly communal venture, with modest contributions not only from working-class members but even from a few inhabitants on parish relief. The Preacher at the opening service the Rev. Charles Silvester Horne (father of Kenneth Horne of 1950s BBC fame). After the service Lady Crisp climbed the tower to set the new clock in motion. 1908 – The first Sunday service was a Civic Service attended by crews from the 1908 Olympic Regatta. The Pither Hall was so named in memory of the Pither family, long supporters and member of the church down to the present day. The Mayor of Henley from November 1908 was Alfred Pither (whose grandfather joined the church in 1841). Alfred was a deacon of the church, his brother was Church Treasurer up to the 1960s and his son Raymond was Church Secretary. 1972 – The Congregationalists remained an important part of the town’s religious life throughout the 20th century and from 1972 as part of the United Reform Church from 1972. 1995 – a new building project was initiated to encompass the church and halls all within a covered concourse as well as adding modern halls and a small chapel. 2000 – This new community centre, called the Christ Church Centre, was opened at the church. and is an active place throughout the week. Christ Church truly remains at the heart of the Henley community almost 350 years after its birth. This URC church became part of Christ Church Henley in 2009. The Church was built in 1807 but there are no records of church affairs before 1810. The first century celebrations were held in 1910. A manse was added in 1832 and the schoolroom in 1872 as a Sunday school. Click here for more historical details. Pheasants Hill Church closed on 30 October 2016. Its members continue to worship at Christ Church Henley and with other churches in the Hambledon Valley.